Coughing and aching chests can be an annoyance. Luckily these woes are often calmed by drugstore decongestants. Unfortunately, in some cases, no amount of decongestants will help because the problem isn’t an irritated chest; it’s actually heart valve disease. These kinds of dangerous leaks can be caused by infection or inflammation in the heart valve, a condition that is known as mitral valve prolapse (where valves are floppy and cannot push blood through effectively) or by an enlarged heart or aorta. You may hear the term, “heart murmur” used in conjunction with heart valve disease. That’s because heart murmurs are commonly caused by this leaking valve problem. Although heart valve disease is often present at birth, it can occur later in life as well. Sometimes heart valve disease can also be worsened by certain conditions such as diabetes. Your doctor will listen to your heart for abnormalities and may request echocardiograms (a form of heart ultrasound) or other tests to see if there is a heart valve that is working insufficiency. If this is found to be the problem, then surgery to repair or replace the valve is often necessary. While a cough may sometimes indicate a heart valve problem, sometimes it’s just a cough. Only go to your doctor if your cough doesn’t clear up for several days or if decongestants don’t help. 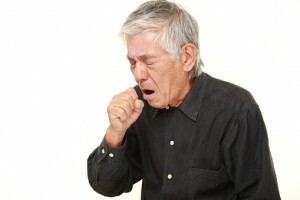 Remember that an abnormal cough is usually accompanied by feelings of fatigue, dizziness, increased heart rate (pounding heart), chest pain, and difficulties breathing when lying down or performing physical activity. If you experience any of these problems, see your doctor.